Happy 2015! It is hard to believe the holidays are behind us and a bright new year is before us to make even better than last! On one hand, I’m always sad right now after taking down my Christmas decorations (the house just seems a little less cheerful) but on the other hand, I’m full of hope as I feel fresh after some down time and ready to launch into a new year. Every year brings unique challenges and I strive to be more calm and balanced in all areas of my life this year while keeping my health and my family at the forefront of all I do. 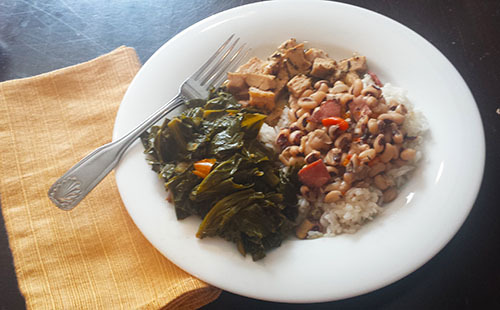 Plus, I made sure to eat my collards and black eyed peas on New Year’s Day like I always do for health and prosperity this year! So my menu planning here on my blog has been sporadic the past few months. That has been for a variety of reasons which I won’t bore you with, but I’m beginning a new now. Often, I have a mental menu plan, but I need to start writing it down again. 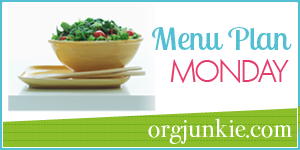 It is hard to believe that it was 4 years ago when I committed to making my weekly menu plans and posting my Menu Plan Monday on my Nourish & Flourish blog. It has certainly brought me peace of mind and ensured my family is well fed. And accountability here has also helped tremendously. Did you see my top posts of 2014 (and interestingly enough most of these weren’t even written in 2014, yet they were the most read!)? Have a wonderful week!